It’s almost spring, and with a new season comes new opportunities to be more true to ourselves as musicians and as people. If you are a violinist who has ever considered playing the viola, this may be a good time to think about making a switch, or at least becoming more comfortable on the violin’s darker cousin. Like many violists, I started my musical life on the violin, not switching until well into high school. But once I made the switch I knew I had found my instrument. The viola was such a better match for me, expressing what immediately felt to be my own true musical voice. Practicing went from being a chore to an exciting exploration of a side of my personality I had been neglecting. But how? If you’re a violinist, and can get access to a viola to play, it’s simple enough to pick it up and start making sound. But is it really the same as a violin? What do those of us who play the viola have to do differently from violinists to sound (and feel) great on the instrument? Over the next few entries, I will be exploring what it means to play the viola, in a series I’m calling “Everything You Ever Wanted to Know About Playing the Viola* (*but were afraid to ask).” We’ll cover the gamut, from clef-reading to setup, from sound production to keeping your body happy and healthy. Violinists may find useful advice that they can bring back to their “instrument of origin,” and I hope that even seasoned violists may find something helpful and new to integrate into their playing. Of course I’m also excited to know what works for you--I look forward to learning from you in the comments. For today, let’s begin at the beginning. What do you do when approaching the viola for the first time? Let’s talk a bit about the physical set-up of your viola. Although this is a controversial topic with opinions as varied as there are different players, certain things seem to resonate for me again and again. You are an individual, with your own characteristics. Luckily, the viola doesn’t have standard sizing, which is actually kind of a wonderful thing! Your height, the width and strength of your back and shoulders, the length of your arms, fingers, and neck--each of these has profound implications on what size and setup of a viola might be ideal for you. To have a positive first experience on the instrument, it is important to start out playing on an instrument that fits your body well. ...and you’ll see how much the performer prioritizes maintaining the integrity of that arrangement. This allows the contact point to always have a consistent focus, and (as we will discuss next time) the contact point is where all the magic happens! To complete the setup on your viola, don’t forget to think about the right chinrest—remember that these can be swapped out on an instrument—and, if needed, a shoulder-rest that fits you well. I talked about how to position the instrument before talking about these items because you want the chinrest and shoulder-rest to fit your playing position, instead of the other way around! Bring a teacher or friend you trust to your string shop and try out different chinrest and shoulder-rest combinations. A good shop will be glad to help you try different options. (Don’t feel guilty about using their time this way--you will likely be buying something, and if you have a good experience, you are more likely to return to the shop.) Many violists feel that they need extra padding on the lower edge of their shoulder rest to support the gap between instrument and torso. You have likely seen players with extra sponges or cushions attached to their shoulder rest with a rubber band. Don’t be afraid to look at an option like that, if it helps you position the instrument well. Also, some violists like the Bonmusica shoulder rest because it is very customizable (you can actually shape the rest with your hands), but plenty just go with the old-school Kun, or other similar options. I appreciated this blog because, like many on this site, I'm a violinist but viola-curious. I noted one claim that I see quite often: "Just like on the violin, the top surface of the instrument should stay parallel to the floor (like a tabletop)." When watching well-regarded violinists and violists I have found that this is simply not true. The violin may be parallel to the floor (or nearly so) along its long axis but the short axis is tilted toward the player's chest. Therefore it is not like a tabletop, and not even close. And frankly the long axis very often is tilted down too. I support my counter-claim by directing the reader to YouTube and looking at videos of Heifetz, Hahn, Mutter, Oistrakh, Jansen, Bashmet, and Primrose. Sometimes the angle of the short axis against the floor is as much as 45 degrees. But really, my biggest beef with the viola is the silly alto clef. It's one seventh down, right? Why can't they just make it a damned octave and be done with it, that way anyone could read it straight off (including -- gasp -- amateurs). "Oh but the clef is so critical to the character of the viola, etc. etc." Yeah, yeah, B.S. With modern software it should be nothing to make new editions. Y'all have to use treble clef for the high stuff anyway, with an octave-down clef you could just use 8va markings. Everyone wins. The alto clef suits the range of the instrument. It's more of an orchestration issue than anything. Writing for the viola using treble and octave treble (below) makes it so that one has to notate the notes for the C string using excessive numbers of ledger lines, or use octave treble (below) for only the C string. That doesn't help with the readability. I teach my junior high school orchestra classes how to read all the different clefs for each instrument. Once they understand how the clef symbol indicates the reference pitch for the staff, it's simply a mechanical process to figure out all the other notes. A seventh vs an octave really makes a difference in ledger lines? Thats hard to believe. Violins are also held at 45 degrees out; the bigger issue for viola is the size. If it slopes down too much it will make producing a good strong tone more difficult. The clef is easy - just learn open strings first and you have a good reference point immediately. I have swapped a number of students to viola with very few reading problems. While someone may be "viola-curious" (which is like going into jail a violinist and coming out of jail a violist...), I found it best to learn the viola as a completely different instrument ~ not as a larger violin with thicker strings. If one learns different languages by translating every word, you will never master a new language; you will still dream in your first language and be hesitant in expression. A violinist who changes teams needs to think of this experience like driving a car versus riding a bicycle, both of which are about getting from point A to point B. In the end, I count my blessings as either violinist or violist. Think of the mighty cello, which requires you to know three clefs to play the basic concert repertoire! Thanks. This should be a very useful series to anyone wanting to dabble in the viola. As a violinist who does so, I recognize many of the tips. In particular, most of those beginning viola have the urge to get the biggest, most resonant instrument they can find. These is not necessarily a good idea and can be counterproductive. Also, it is worth noting that Zlata Brouwer's excellent videos on this site deal to some extent with how violinists and others can best approach the viola. So, between Zlata's and Jonah's posts, those contemplating a voyage to the "dark" side will be well-prepared. Jonah, what kind of cookies? By the way my daughter calls it "thirteen clef" because of the resemblance to 13. She is a cellist though, so its tenor clef in her case. Why cellists do not just use treble clef (for the high stuff) I will never understand either. I once saw a pro violist whose SR was so elaborate and large, it looked like a box girder bridge under there. Gene, mechanically it just makes sense to tilt, that's my view. If you go too far you do lose the gravitational advantage in bowing. At 45 degrees you have lost only about 30% of that though. Paul -- That's the way I feel about the tilt. I don't remember how I was taught, and I don't know what they're teaching kids these days. In my own recent experimentation, it seems to make sense. why is it that when I pick up a viola I loose the ability to count? I just rented a viola yesterday, so good timing! There is a problem with trying to perfectly fit the viola to your body: how does that work in practice? The shop I rented from is a well regarded shop in an area with tons of musicians. But their supply of violas was limited. I wasn't given a choice of instruments (except the first one I was offered was their cheapest student model, which declined). Fitting the instrument to your body is more in line with buying, which one wouldn't do if they were just curious. Which leads to another question: might one try playing the viola upright in their lap, like old time fiddlers sometimes did? I've never heard of it but intend to try it. Paul and Gene, yes I think the "tabletop" thing can be taken too literally. I was mostly referring to the long axis when I said that, and even so, it's an ideal to imagine, less one that will always literally be true. Still, with the angle of the string heading "downhill" from the bridge already, and the bow needing quite crucially to track a consistent contact point, you want to do everything you can (within the constrains of physical comfort) to keep gravity on your side, helping the bow stay where it ought, and not sliding "down the hill," make sense? As for the short axis, tilting the instrument down to provide better access to the low string is possible, but can distort the setup. I would say that's more of a player-specific option. Easier with no shoulder-rest. As I use one, I don't do this very much. Alto clef is no weirder than treble clef!! It's what you are used to, I suppose. I will say that reading treble clef down an octave is a nightmare for me, because notes that are spaces in one octave will be lines in the next. Way more trouble than it's worth... If you imagine the alto clef sitting smack dab in between treble and bass (the E and G top lines of the alto staff are the bottom two lines of treble, and the F and A bottom lines of the alto staff are the top two of bass) it makes more sense. I'll get into both of these topics in future posts! Treble and bass clef make sense together because they cross over at a common note (middle C) that is between the two staves. Your idea of alto clef being "in the middle" of the other two, that's very clever and useful. Thanks for that! I agree the long axis of the violin should be close to horizontal. I'm actually pretty good at keeping it there. I see kids drooping their violins and sure enough, their bows wander over the fingerboard too. We have to use gravity to our advantage whenever possible. By the way, thanks for being a champion of modern composers. Your musicality and technical mastery are well suited to this task. Francesca, playing the viola upright might work, but good luck finding a teacher who will help you with it that way. I think you do what we all do, tinker around with SR and CR until you can manage it for at least a little while and then re-evaluate. I call myself The Accidental Violist because I got dragged into an orchestra which was in serious need of violists. Like some others, my crash course in viola had me first thinking of it as a large violin before I realized that it's best thought of as an entirely different instrument. Playing transposed violin parts just doesn't cut it - you'll never really get into those dark chocolate depths where the viola comes into its own. As for learning alto clef, many people make too big a thing of it. Sure it's confusing at first, especially after a lifetime of reading treble clef. But give it some time. As someone else said, start with the open strings as a reference, then gradually fill things in. After a couple of weeks you'll be reading it well enough to play, and after a few months you'll be able to switch clefs quickly, even in the middle of a piece. 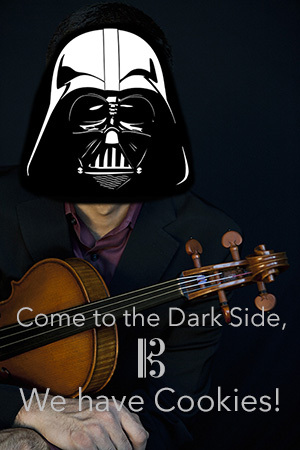 Try to find a real viola teacher, not a violinist who's trying to switch-hit. When I started viola, my violin teacher flatly refused to have anything to do with it. I now have a teacher who plays viola in a large orchestra, and my lessons are specifically tailored to the instrument. My teacher is after me to keep the viola up, level with the floor. She also cautions me about tilting it too much, explaining that - especially on the higher strings - it doesn't let gravity assist the weight of the bow. You do need to dig into the strings a bit more to get a good sound, but it's kind of fun - and you're not as likely to crush a note as you are on a violin. I still play violin - it takes a bit of adjustment to the lighter bow pressure and closer note spacing, but I can usually adapt in a few minutes. When I take my fiddle to bluegrass jams, I sometimes bring along my viola, especially on the nights when I go directly from my viola lesson to the jam. When I start sawing away on that C string, it turns a lot of heads. And it's fun to seduce people by handing them the viola and getting them to draw the bow across that C string. "Come to the dark side..."